Pier 60 at Clearwater Beach has a nightly sunset festival. 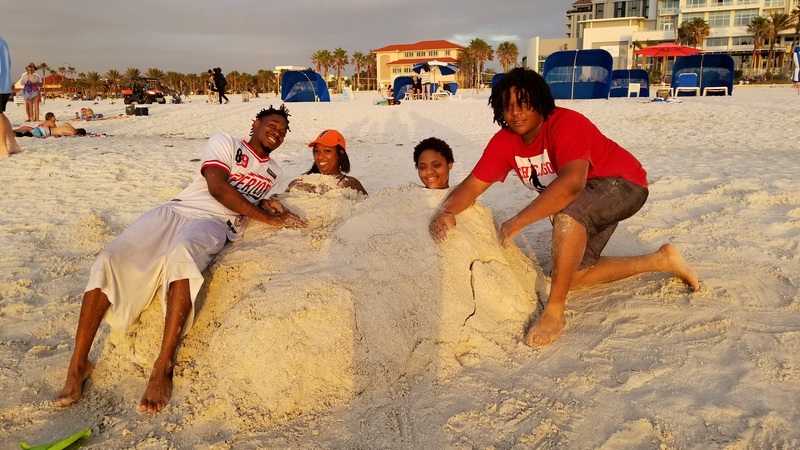 Burying friends in the sand is a favorite Clearwater Beach activity. The Clearwater Bay area is famous for its fishing, tour boats and watersports. 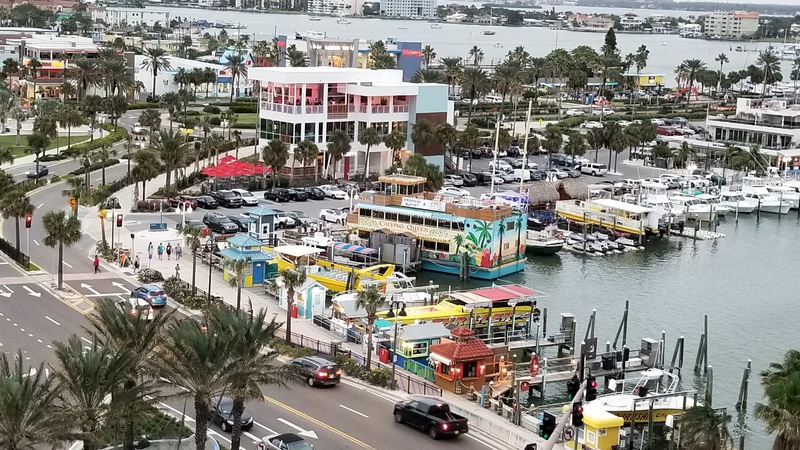 The St. Petersburg/Clearwater area provides so much of what a vacation in Florida should have: some of the nation’s finest beaches, facing the calm and shallow Gulf of Mexico, fun eco-adventures in the wild, plus many family-friendly attractions and resorts. This great spot is a 90-minute drive from Orlando’s Walt Disney World, SeaWorld, and Universal Studios, and just 30 minutes from Tampa’s Busch Gardens. 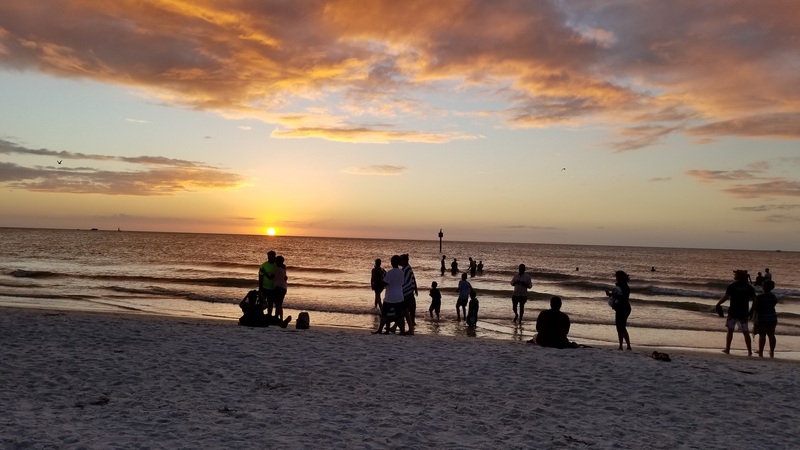 For general information, see Visit Clearwater tourism office; for where to stay in the area, read our story on Favorite Clearwater Beach, Florida Resorts. This is the home of Winter the dolphin, star of the movie “A Winter’s Tale,” which brought her amazing story about being rescued and getting a prosthetic tail into the homes and hearts of animal lovers of all ages. You can visit Winter here and learn more about the inspiration she’s brought to many handicapped children and adults. In addition, this small aquarium is really a marine hospital dedicated to the rescue and rehabilitation of injured and sick sea animals, so your family will get to see sea otters, turtles and other animals and learn about the CMA’s marine research. Kids will love the live displays of local Gulf marine life, including their guided cruises to see dolphins, sea turtles and much more in Clearwater Bay. Ask about their programs designed for young visitors and if you’re traveling with someone with special needs, be sure to book ahead for a personal encounter with Winter and her trainers. This museum has not supported a “hands off” policy for more than 30 years. Children are encouraged to touch exhibitions and partake in programs that provide opportunities to arouse their curiosity. Exhibits include The Touch Tunnel and Critter Cave, The Express Yourself Art Studio and I Can Construct, among others and, if fund raising efforts succeed, visiting families will soon find a greatly expanded learning environment. This center motivates students of all ages by offering a “hands on” approach to learning about science. Included are science laboratories, workshops, field studies, and exhibits. Kids might enjoy the planetarium or observatory, the marine touch tank or the animal room. In summer there are daily kids camps for grades K-3 and 4-6 that introduce science principles in a fun way. Captain Memo’s features family-friendly sightseeing and sunset cruises along the Gulf’s white sand coastline. With a pirate theme, expect treasure hunts, watergun fights, face-painting, stories and dancing. Soft drinks, beer, wine and champagne are also provided while you search the seas for plentiful dolphins. A variety of cruises on a 125-passenger catamaran allow kids to see beautiful marine animals in their natural surroundings. Dolphin Exploration Tours are 2-hour excursions into the Gulf of Mexico, during which passengers are guaranteed to see bottlenose dolphins and some of the celebrity mansions along the coast. Honeymoon and Caladesi Islands Tours are 2 1/2-hour-long trips to the picturesque barrier islands and also offer dolphin sightings. Note that alcohol is served on sunset cruises. At speeds of up to 35mph, visitors can take an exhilarating ride for a narrated look at birds and marine life around Boca Ciega Bay and the Gulf of Mexico on the Sea Screamer, the world’s largest speedboat. See bottlenose dolphins as they frolic in the wake of the boat, close enough for great picture-taking. Be warned – some seats will get wet in this open-top boat! This 100-year-old garden is a popular attraction among nature lovers, with beautiful botanical displays, a flock of very pink flamingoes, a butterfly aviary and waterfalls. There are children’s activities, wildlife presentations, regular musical performances, themed afternoons and tours. At one convenient attraction, a visitor can relax in the shade, take in the scents of tropical flowers and walk through an aviary of macaws and other tropical birds. Pier 60, which juts out into the Gulf at the midpoint of Clearwater Beach, has become the town’s focal point for sunset activity. With musicians, fire-juggling performers, crafts vendors, snack stands and more, it’s the place to be nightly from around 5:30-9:30pm. On summer nights, there are often outdoor movies and, during the annual April Sugar Sand Festival, there’s non-stop activity as the world’s great sand sculptors compete for prizes. The Pier hosts a number of free entertainment events; check their site for listings. This contemporary museum of more than 2,000 surreal and often eccentric works by Spanish artist Salvador Dali (1904-1989) is sure to interest, if not intrigue, children of all ages. Everything is well labeled and done in an educational context, providing plenty of fodder for stimulating conversation. In addition to the permanent collection, there’s a new Virtual Reality view of Dali’s work plus temporary exhibits that relate fashion to his work. The building’s architecture, with aspects of fantasy, mirrors Dali’s work — it’s part geodesic glass bubble, made of 1,062 glass triangles, and part an homage to the dome of the Dali Museum in Spain. Inside, the helical staircase references Dali’s use of spirals and double helix in his work. Fort De Soto Park is the place to spend a quiet day. This pristine park consists of 1,136 acres made up of five interconnected islands (keys), home to beach plants, mangroves, wetlands, palm hammocks, hardwoods, scores of native plants as well as 328 species of birds. Seven miles of beaches, two fishing piers, a dog park, covered picnic shelters, camping areas and hiking and biking trails on the Gulf of Mexico have appeal for everyone. Rental canoes, kayaks and bicycles as well as concession stands and bathrooms are available. Only accessible by boat, the completely natural island is suitable for swimming, shelling, fishing, picnics, scuba diving, and nature study. There is a three-mile nature trail, which winds through the island’s interior and a coastal kayaking trail. A snack bar and shelters are available. A ferry departs daily from nearby Honeymoon Island to bring you to this barrier island. As a non-profit refuge whose mission is the rescue, rehabilitation and release of the injured and malnourished, this sanctuary treats up to 3,000 birds annually at their on-site hospital. There are about 100 residents who are too injured to be returned to the wild, so visitors can see them, watch pelican feedings, and tour the open-air facility and beachfront area free every day of the year.